I never really use to enjoy reading. That was because I wasn't interested in the genre of the books at all. The only book I really loved in primary school was Holes by Louis Sachar. Finding out what sort of books your interested in makes the task less daunting. Reading plays a bigger role in our lives that you can imagine, in school, work even on social media! A website that I love for purchasing books is called Book Depository. They cater for nearly all books of all genres for unbeatable prices and free shipping worldwide! I highly recommend browsing through their amazing selection. 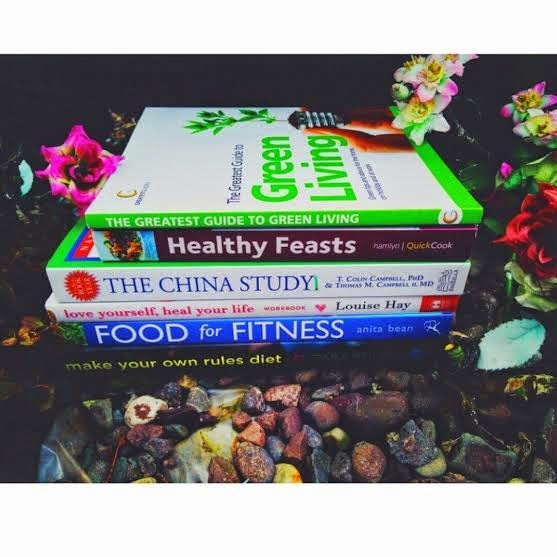 Greatest Guide to Green Living by Lynne Garner. This book aims to give you tips to live a greener lifestyle in your home, work and on holiday. I think it's crucial we take care of planet Earth as it's not ours. We are simply stewards trying to make it better for the next generation. Healthy Feasts by Joy Skipper. The author shares recipes ranging from seafood to snacks. Each dish is illustrated in three ways. You choose either a 30, 20 or 10 minute recipe. I love trying out new recipes so expect a lot of food posts on my blog and Instagram. The China Study by Thomas M. and Colin Campbell. These doctors conducted a study on the relationship between diet and disease. It is one of the most comprehensive studies ever conducted on nutrition. It gives an insightful message to those suffering from cancer, heart disease, obesity, diabetes etc. Love Yourself and Heal Your Life by Louise Hay. This is a workbook about change in all areas of your life i.e health, fears, addictive behaviours etc. I'm a big believer in self reflection, if you cannot pinpoint the problem it cannot be solved! Food for Fitness: How to eat for maximum performance by Anita Bean. This nutrition guide and recipe book is designed to bust all of the food myths concerning working out. When it comes to performing in a sport it's crucial that you get the right information from the right source. Make your own rules diet by Tara Stiles. Tara hopes to bring easy ways to practice yoga, meditation and healthy food into our lives. I'm a student and I get stressed at times and I find it very hard to keep calm and carry on. Hopefully this book encourages me to adopt these healthy habits. P.S if you click on the titled books above it will link you to Book Depository where you can purchase it. Would you like me to review any of these books? What genre of books do you like?